With the last post, we have a dataset generated from Wordnet according to our data model, imported into a Vital Service Endpoint, which could be on our local machine or available remotely. For simplicity, we’ll assume it’s a local endpoint. Cytoscape 3.X (the current version) allows creating “apps” (formerly known as “plugins”) that allow adding additional functionality to the Cytoscape desktop application. Cytoscape supports the OSGI standard ( http://en.wikipedia.org/wiki/OSGi ), which can be a little tricky. However, it provides a general way to include dependencies. The two main implemented functions are: (1) searching the Wordnet data for a matching SynsetNode, and (2) given a particular Wordnet SynsetNode, performing a graph query to add all connected Edges and Nodes into the current graph. 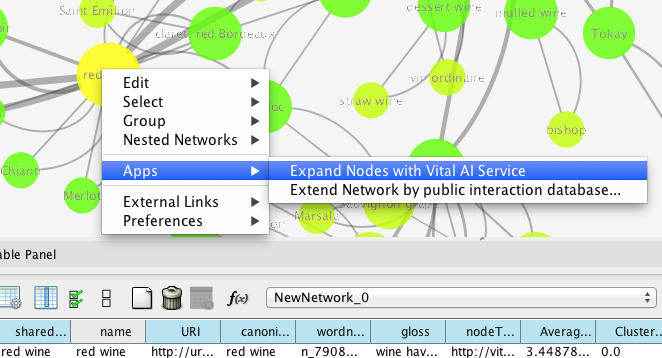 Within the Application class, we connect to VitalService and “expand” a graph object, triggering getting all the connected Nodes and Edges into the local cache, which we can then display. 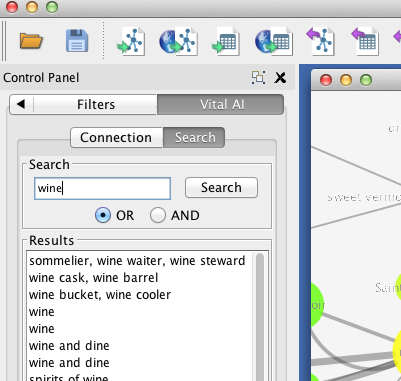 The Vital AI Cytoscape App adds some tabs and contexual menus to the Cytoscape User Interface. Put it all together, and we can explore graph data stored in a Vital AI Endpoint using our new Cytoscape App! Next we’ll use some Graph Analytics to help visualize our data.